Victory to You, Oh slayer of the buffalo demon Mahisasura! Victory to You, daughter of the Himalayas, who has beautifully plaited hair! who is the daughter of the ocean! who attracts her lord like a flower attracks the bees. like a creeper full of red tender leaves. whose beautiful smile enchants the minds of those entrapped by desire. whose swarms of bees fly down from the bakula trees to join with other bees atop the lotus flowers. whose playground is filled with breathtaking tribal women, who are manifestations of Her own great qualities. who was pleased with king Suratha and the merchant called samadhi, who entered in to samadhi and who prayed for endless samadhi. how will one not become wealthy? what riches will not be mine, if I earnestly believe that Your feet are the highest goal to be achieved? I take refuge at Your feet, which are also the abode of Shiva. I am sure you would not reject my wishes. Oh You who removes the pain of Her devotees. The Mahishasura Mardini Stotram is based on the Devi Mahatmya. Because of its very poetic nature and the repetition of words in the same stanza, with different nuances, this stotram is difficult to translate. The Devi Mahatmya ( Sanskrit: देवीमाहात्म्यम् or “Glory of the Goddess” ), is a Hindu religious text describing the victory of Goddess Durga over the demon Mahishasura and is one of the most important texts for the worshipers of Devi, the Goddess. It is part of the Markandeya Purana (chapters 78-90), and was composed in Sanskrit around 400-500 CE. The text contains 700 ( saptashata – " seven hundred" ) verses, arranged into 13 chapters. “She is eternal, embodied as the universe. Everything is permeated by her. Still, she incarnates in many forms. Listen to the story! " The story then tells of the various manifestations of Durga and her battle against the evil represented by several Asuras, the opponents of the celestial devas. Just as in the Devi Bhagavata, it tells in mythological form the story of Durga’s fight against the Buffalo Demon Mahishasura, who is the embodiment of ignorance and spiritual darkness. At the urgent request of the celestial devas, she appeared; they were being terrorized by the demon Mahishasura. After hard asceticism, meditation and prayer, Brahma had granted the demon a wish, that he could only die by the hand of a woman. As he did not believe that any woman could have such an ability, his lust for power grew and eventually, in his boundless arrogance, made himself the ruler of heaven. All should worship him. Shiva and Vishnu became angry when they heard of his activities, and a bright light arose from each of their faces. These joined with the lights from the bodies of the other celestial beings, becoming one single unified light and finally taking the form of a beautiful woman. Each of the celestial devas gave her a weapon, a replica of their own weapon: Shiva gave his trident, and Vishnu his discus. From Surya, the sun, she received the brilliant rays that were shining from every pore of her skin; Kala, the time , gave a sword; the Himalayas gave a magnificent lion as a mount. Finally, the goddess went with “loud roaring laughter” into battle. The mountains shook, the universe trembled and the seas burst their banks. The demon changed his form constantly during the fight; buffalo, lion, and elephant. Finally she defeated him in his buffalo form. However, after the victory, more asuras attacked the celestials and again they begged the goddess for help. During the fight, the terrible black Kali manifested herself from her forehead. 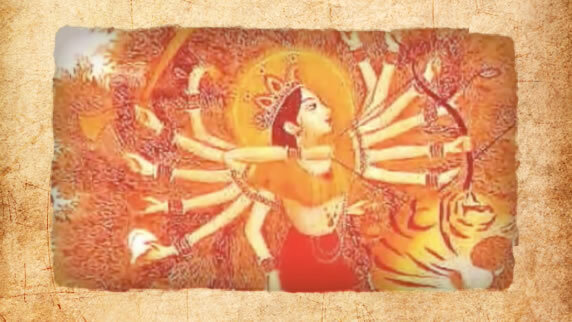 A group of goddesses, the "seven mothers " appeared out of Durga and fought for her. The enemies accused her of fighting unfairly, so she took all emanations back and said, laughing loudly, that everyone was just a form of her. In addition to the popular narratives the work contains important spiritual statements, which are hidden in complex layers of meaning.